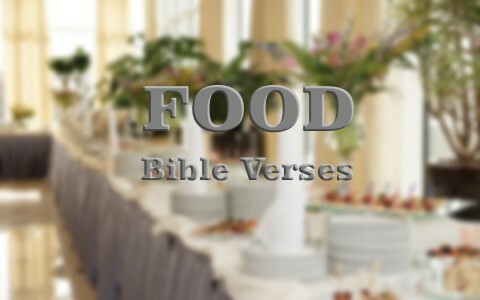 Here are six important Bible verses about food. There is nothing more important about food in this life than to seek the Bread of Life, Jesus Christ. He is the “living bread that came down from heaven” and He is still satisfying those who have been brought to repentance and faith in Christ. Bread satisfies for a day but Jesus Christ satisfies forever because whoever takes of this bread will never die. The ancient Israelites had bread but perished in the wilderness due to their unbelief and disobedience. For those who do believe and strive to live a life of obedience, the “living bread” of Jesus Christ ensures that “Whoever believes in me, though he die, yet shall he live” (John 11:25b). There are some churches who still adhere to the Old Testament dietary laws and a few who look down on others who eat things that they consider unclean, however my question to them would be; are you Jewish? Do you know that these dietary laws were written exclusively to Israel? Do you know that Jesus declared all foods clean? Jesus reminds us, as I reminded my friend in the church, “Do you not see that whatever goes into a person from outside cannot defile him, since it enters not his heart but his stomach, and is expelled?” (Thus he declared all foods clean.) (Mark 7:18b-19). God is such a good God that He feeds even those who are not His own as “he makes his sun rise on the evil and on the good, and sends rain on the just and on the unjust” (Matt 5:45). In other words, God has not left the world without a witness of His goodness, giving to the just and the unjust the season rains, meaning that He provides the ability for crops to grow and to feed even those who are outside of the family of God. That’s why those who reject Christ are without excuse (Rom 1:20) because they are only suppressing the obvious truth of God’s existence (Rom 1:18). There are dozens of Scriptures which admonish Christians to help feed the poor. The primitive church of the first century shared what they had with those who had little or nothing, and this is in their best interests because God will blessed the “bountiful eye” who looks for those in need. The “bountiful eye” is an eye that looks to be generous with what they have so that others would not go hungry. Jesus reminds us “I was hungry and you gave me food, I was thirsty and you gave me drink” (Matt 25:35) but when the saints asked, “when did we see you hungry and feed you, or thirsty and give you drink” (Matt 25:37), to which Jesus says, “as you did it to one of the least of these my brothers, you did it to me” (Matt 25:40). So feeding the poor is in effect, feeding Jesus, because these are “the least of these my brothers” and sisters. Years ago, we invited an orthodox Jew to dinner and we knew what to put on the table and what not to put on the table. We didn’t want to cause any unnecessary offense to this man. We did this because of the biblical command to not cause offense or cause a brother or sister to stumble, and even though this man was not technically a brother, we still didn’t want to offend him or make him feel uncomfortable, because it was as the Apostle Paul said, “Therefore, if food makes my brother stumble, I will never eat meat, lest I make my brother stumble” (1st Cor 8:13). We had plenty to eat because God has blessed us, so we should share with those who have little because “if anyone has the world’s goods and sees his brother in need, yet closes his heart against him, how does God’s love abide in him? Little children, let us not love in word or talk but in deed and in truth” (1st John 3:17-18). If we have not yet been brought to repentance toward God and placed our trust in Christ, we will not have a hunger or thirst for righteousness, and neither will we care for the poor and hungry like those who have God’s Spirit, so Jesus says to all, “I am the bread of life; whoever comes to me shall not hunger, and whoever believes in me shall never thirst” (John 6:35). Bread or drink can satisfy…but only for a short time, but Jesus satisfies forever and those who take of the Bread of Life will never hunger again and even more so, we look forward to the greatest banquet or feast in all of human history. I am referring to the marriage feast of the Lamb of God with His bride, the church (Matt 22:1-14). In the meantime, “If you pour yourself out for the hungry and satisfy the desire of the afflicted, then shall your light rise in the darkness and your gloom be as the noonday” (Isaiah 58:10). More for you to read: Does the Bible Talk About Eating Healthy? Next post: What Is Faithism And The Oahspe Bible?